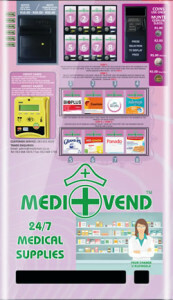 The Medivend product range caters for the common head-aches, sinuses, stomach ailments, energy boosters, sanitary requirements, aches and pains etc. Offers a selection of a mimimum of 8 products but can be extended to 16 products by utilizing an additional “slave” unit. The unit is compact with the following measurements: Height: 830mm, Width 500mm, Depth 180mm. The machine is programmed to accept notes and coins as well as a facility for the customer to purchase with a conventional credit or debit card. The machines are installed free of charge and remains property of Medivend which is a subsidiary of FB Vending. The units are serviced and maintained on a weekly or fortnightly bases by the technical staff of Medivend.